310 pages | 5 B/W Illus. 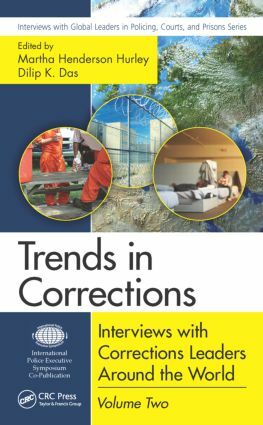 The first volume of the Trends in Corrections: Interviews with Corrections Leaders Around the World series introduced readers to the great diversity that exists cross-culturally in the political, social, and economic context of the correctional system. Presenting transcribed interviews of corrections leaders, it offered a comprehensive survey of correctional programming and management styles used across nations. The general conclusion drawn from the inaugural publication was that the correctional leaders interviewed exhibited striking similarities despite vast differences in the social and political climates in which they worked. They all appeared to struggle with some of the same issues. With a fresh set of interviews exploring further cross-cultural differences and similarities, Volume Two extends the reach to several new countries, including Slovenia, Slovakia, Northern Ireland, Switzerland, and France. The interviews are conducted by scholars or practitioners with intimate knowledge of correctional practice and who are familiar with the correctional system in the country of the interviewees. They expand the knowledge base by asking correction leaders specifically about the impact of the economic downturn on corrections in each country, the changes in correctional practice they’ve experienced, and how they think about and evaluate trends and developments. This revealing series affords correctional leaders an unprecedented opportunity to express their views on current practices and the future of corrections in their countries, facilitating the development of solutions to corrections challenges worldwide. This book is a volume in the Interviews with Global Leaders in Policing, Courts and Corrections series.
" … a resource of immense value to academic analysts of policing philosophies, leadership, contemporary change and likely futures, as well as to policy-makers and practitioners who wish to have a sense of where the leaders in their field have come from and are going." Martha Henderson Hurley is department head and professor in the Department of Sociology and Criminal Justice at Texas A&M University-Commerce (USA). Specific areas of research and teaching experience include criminal justice ethics, risk assessment and classification, analysis of performance measures, organizational change, prisoner reentry, special populations, and implementation of evidence-based practices in corrections. She has also worked as a senior researcher for the Ohio Department of Rehabilitation and Correction and served as a research analyst and facilitator of group sessions in a community-based juvenile program.